Done on location last Sunday. I worked on it a bit when I got home to correct one or two values. For example I had made the sunlit stone wall the same tone as the grassy area behind. I altered the values making the wall lighter and the grass darker. The elements then fell into place. The hillside behind is Tarnbrook Fell, historically the finest grouse moor in England. I like these two. You have begun to capture that feeling of sun light. I'm looking for strong compositional elements with bigger shapes and those all important shadows. Painting as often as possible really does help to improve skills. 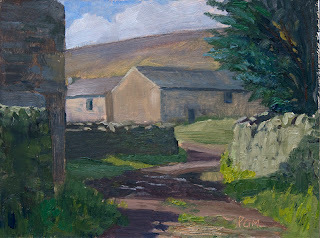 I've been looking at David Curtiss's landscapes and these are very instructive in the observation of light effects. I don't know what your experience of art school was but I never really learned the skills of painting there and regard myself as self taught. The activity of Plein Air painting was actually derided in some quarters.